Talk about some extreme angling. Surf casting outside Perth on the western shores of Australia, two anglers reeled in a 12 feet seven inch hammerhead shark and unofficial record. It took Jamie Dennis and his mates with Frontline Fishing 90 minutes to reel in the giant hammerhead. But they made a big mistake on their measurements. They forgot to measure the girth, disqualifying it from an official record. But it was sure to beat out the previous record of just over 12 feet, but no one will ever know. After releasing the beast, they followed in a kayak as he disappeared into the deep. They managed to get a photo and a video to save for the posterity. On his Facebook page announcing the catch, Dennis showed his excitement. 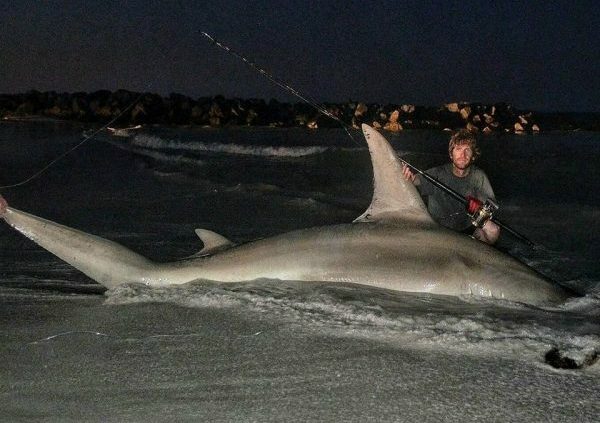 “…cant believe this day i caught my dream shark my first ever greater hammer this shark was (3.85m) caught it on the smallest gear possible (not intentionally) and with 65lb xtremebraid,” he said. He said later they used a live mullet to make the catch. Quite something when you can pull a creature out of the water that’s capability of killing you. Catching one of these sharks is no easy task. As you can see from his other videos, Dennis and the crew use harnesses to stand up to hours of heavy pressure.